The GOE organisational chart shows the relationship between the company’s various departments. Our company is organised into the four basic departments. All departments shown in the chart cooperate as required to achieve good business results and client satisfaction. All of the departments are managed by experienced project managers who know how to bring out the best of our engineers and encourage their creativity and innovatively. The design and engineering department is a place where new ideas are born. This department is the technical backbones of our company. Development and production of subsea tools and equipment represents complex engineering challenges in the oil and gas industry. They incorporate many fields of engineering, from idea and development to manufacturing. 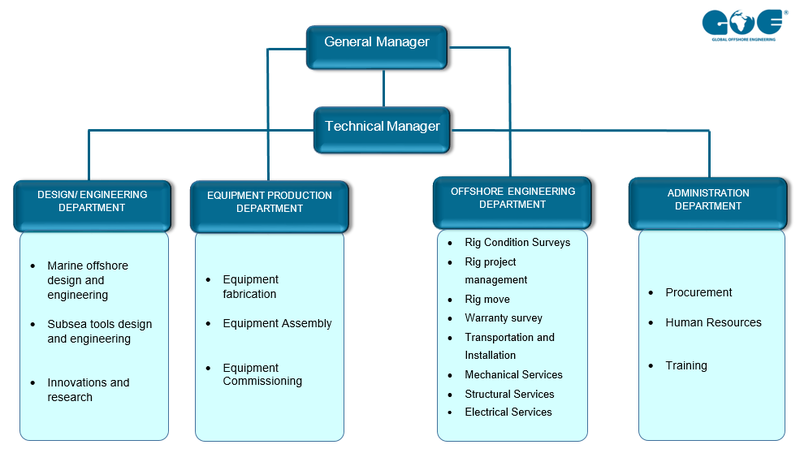 The offshore engineering department comprises mechanical, structural, naval and electrical engineers who have extensive experience in the offshore industry. They are a synchronized team able to provide complete rig repair and maintenance services, rig condition surveys and a complete range of project services worldwide.